Did you have a chance to visit the Arts and Crafts building at summer camp this year? Of special interest to me was the day the campers painted a “self-portrait” using multiple forms of media; paint, pencil, beads, and fabric. The activity was fun and met with enthusiasm. From week 1 to week 9 the self-portraits were all so similar yet all so different. 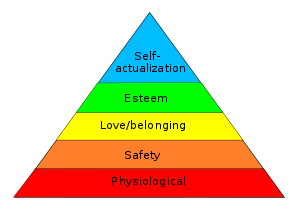 We know humans need food, safety, belonging, but let’s move beyond these essentials higher on the pyramid of needs where we find ESTEEM. The self-portraits made by our 4th-6th grade campers reminded me that unlike food and shelter that we can provide for children, self-esteem is definitely something which has to come from within a child. In 1943 Abraham Maslow wrote a paper “A Theory of Human Motivation” and basically set in motion a prescription for success for children. Child Development programs (such as 4-H) have been using his theory for 70 years now and his theory is still considered relative to humans around the globe and across all races and cultures. For youth to reach their potential they need to have all needs met and self-esteem is at the top of the pyramid. In 4-H we promote good character and decision making but attached to these we need to acknowledge that in tough circumstances children with high self-esteem are more equipped to thrive. They can cope with a bully and do not feel useless, helpless, or inferior. They feel strong and empowered to support people who need care and are confident in their choices. Can 4-H agents and other adults help improve self-esteem in youth? Yes. Maslow’s research indicates that by providing a safe environment and encouraging youth to take ownership of their choices and decision making that success will follow. When 4-H agents use the Essential Elements to promote youth development they are directly helping youth gain self-esteem. The Essential Elements are belonging, independence, generosity, and mastery. One central theme in 4-H is the 4-H Club Meeting which provides all of the Essential Elements for our youth. Club meetings should be held on a consistent basis, be led by youth, and encourage active participation. The youth will blossom and their self-esteem will grow until they feel secure and competent to lead, not only the 4-H club meeting but, many other areas in their life. If you want to dig deeper please check out the resources below on the Essential Elements of 4-H and also Maslow's Hierarchy of Needs.